The WordWise Blog: Book Review: Boy Meets Girl; Will They Get Out Alive? Book Review: Boy Meets Girl; Will They Get Out Alive? So, what’s wrong with our world today? There are many answers to this important question, of course, but let me posit a scenario: Children grow up without godly values. Because their parents have a lousy marriage. Because they started out with a directionless courtship. The consequences are huge, and far-reaching. In his new book Dating Like Airplanes, Caleb Breakey doesn’t preach. He shares his own struggles in pursuit of (now-wife) Brittney; his mistakes, joys, and hard-learned lessons. True love is about giving, not taking. Waiting, not rushing. Self-examination, and seeking advice from those who have gone before. As I think back to my own adolescence, my local congregation had an active teen ministry: We studied for hours on end about Old Testament customs, or the genealogy of Jesus. But practical advice that we can actually use, at a crucial time in our lives when we’re facing so many important decisions? Nothing. And I mean, nothing. Come on, we’re all adults here; one man may struggle with drinking, and another with gambling; but sooner or later, we all face the challenges of love and lust. I must admit that I sometimes found myself disagreeing with Caleb’s theology, and his practical application. Still, I’m gratified to see that someone has tackled this difficult issue in an easily readable conversational tone. After eighteen years of marriage, I didn’t expect to be moved by a book about courtship. I’ve got my girl, and we fully believe in that “till death do we part” stuff. But this book isn’t just about how to find a spouse. It’s about being a friend, becoming a better person, and learning how to lead a life that honors God. I’m down with that. 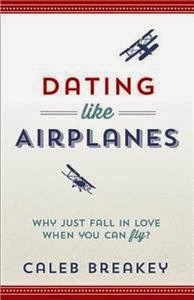 So exactly what does it mean to “date like airplanes?” I won’t spoil it for you. I'm sneaky that way. Hmmm. Now I'll have to read it!